Jake Smith a.k.a. The White Buffalo returns with another collection of richly crafted Western folk rock songs. This time out, Smith works overtime as a prolific storyteller as Shadows, Greys, and Evil Ways tells one arresting tale that spans an entire lifetime. All 14 tracks revolve around the life of Joey White, a small- town outsider who goes off to war. When he returns home, he struggles to readjust to everyday life. The girl he left behind is the center of it. Shadows, Greys, and Evil Ways is sorrowful. What makes the story especially tragic is that White only enlists as a means to support the girl of his dreams. What they never consider is that the experience of war will change him and, consequently, any chance that they might have had at a future together. The album was introduced with Don't You Want It, an upbeat but tempered song reflecting on the past. There is a hopefulness to the song, more than most, especially as it conveys a sense of becoming comfortable with oneself (good and bad) while looking forward to a fresh start. Don't You Want It comes much later in the album and offers a brief respite of relief for White. Conversely, many of the songs take snapshots during more venerable times in his life, when Smith takes full advantage of his rugged, weathered and world-weary voice. Although White is often referred to as the White Buffalo, the band also consists of core members Tom Andrews (bass) and Matt Lynott (drums). Also joining them on this album is drumming legend Jim Keltner on “Don’t You Want It” and former Jayhawks violinist Jessy Greene. The balance of the album is starkly diverse, like life. Although Smith is among the first to call his album a tragic, Shadows, Greys, and Evil Ways covers significant ground. The album ranges from acoustic folk to country rock, opening with a gentle folk rock song that will ring with immediate familiarity. While the tone of the opener is somber, the lyrics of Shall We Go On convey an immediate and relentless connection between two young people with their whole lives ahead of them. The wrinkle is made apparent in The Getaway. Circumstance threatens to keep them apart. When I'm Gone changes the tempo, portraying the protagonist as someone who is strong and determined, willing to enlist as a means to provide. The track is immediately contrasted with 30 Days Back, a dire and regretful track that powers through in under a minute and a half. Many of the tracks that follow, regardless of the tempo and change-ups, dwell in an attempt to reconcile the past and find resolution in the present. White faces temptation, damnation, and redemption until This Year, which provides the first glimmer of hope for a protagonist on the ropes. Even so, reconciliation doesn't necessarily come easy. Interestingly enough, Shadows, Greys, and Evil Ways didn't start as a concept album. It wasn't until Smith was halfway through the album before he started to recognize a singular thread. The album was recorded at Unison Music Studios in Los Angeles and produced by the Grammy-nominated team of Bruce Witkin and Ryan Dorn. Shadows, Greys, and Evil Ways Shines 7.8 On The Liquid Hip Richter Scale. As much as the concept album adds something impressive to his growing repertoire, Smith sounds slightly boxed into the story he wants to tell. While the album is brilliant, it isn't necessarily stronger than previous outings. At the same time, it's not a story you want to miss from beginning to end. Shadows, Greys & Evil Ways by the White Buffalo can be found on Amazon. You can also order the album from Barnes & Noble or download it from iTunes. 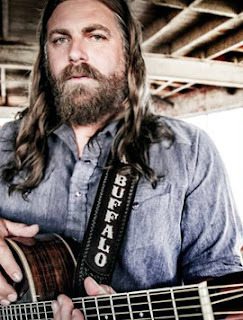 The White Buffalo is currently booking events in Arizona, California and Colorado. A special appearance is slated for Tennessee on Sept. 21. For other event dates, visit the White Buffalo on Facebook.